If you are looking to get the biggest bang for your kitchen remodeling dollars, a quartz countertop is a winning bet. Quartz is an engineered material that is both heat and stain resistant making it a perfect choice for busy cooking spaces. Its manufacturing process involves combining around 95 percent ground quartz, which is one of hardest minerals on the planet, with a mix of polymer resins. The finished result is an incredibly durable stone-like surface that can stand up to daily wear and tear. Just as convenient, the engineered material does not require sealing like natural stone surfaces such as marble or granite. When it comes to looks, quartz countertops are available in a wide range of colors and even better, stone-like patterns that seriously look and feel like the real thing. To get the gist, check out our favorite quartz countertops for kitchens. Waterfall quartz countertops are becoming a staple in ultramodern cooking spaces like this one by CaSA — Colombo and Serboli Architecture. Kitchen counters like these have a hallmark edge that starts at the top and continues down to the floor creating a seamless surface that is either an upside down C or L shape as shown. The bright, quartz countertops in this salmon-colored kitchen is a shade called Miami White by Silestone. When it comes to kitchens, nothing is quite as luxurious as a three-inch thick quartz countertop as shown in this cooking space by interior designer Ann Lowengart out of California. The countertop shown here is by Caesarstone in Pure White. The company has been manufacturing high-performance quartz surfaces in a wide range of stones styles and colors for more than 30 years. Whip up a dramatic statement in your kitchen with a veiny, cobra black quartz countertop. The engineered slabs used in this condo kitchen by Los Angeles, California based Black Lacquer Design resembles luxurious Calacatta marble. This glossy cooking space by Parker Bathrooms based in the U.K. is brimming with striking pops of color. The countertops and backsplash are polished, black quartz. The lacquered kitchen cabinets bring a colorful contrast that draws the eye closer. The interior design firm, Plus Rooms situated in the London, elevated this retro-inspired kitchen with quartz countertops that resemble Calacatta marble. When designing this small, apartment kitchen, the goal was to keep things light and airy. Utah based interior design firm, Studio McGee got a chunk of the job done with a Cambria Quartz countertop. Black appliances and dark decorative accents add bold contrast to the mostly pale, neutral space. There are several different edge styles for quartz countertops. For example, take a good look at this kitchen island. Maya Wilson Interiors out of the U.K. selected a rounded edge bullnose style. It beautifully shows off the counter's white and black specs. This gorgeous blue and white kitchen by Brooklyn based interior design firm White Arrow features a quartz countertop that is a dead ringer for Carrera marble. The essential need to know, while coffee, juice, tomatoes, and wine, can easily stain natural marble, you will not have that worry with engineered quartz. Concrete countertops are insanely popular these days, but just like natural stone, the material can stain easily if not properly sealed. Enter: quartz countertop manufacturer, Caesarstone. They engineered the quartz countertop in this cooking space designed by Holmes Hole Builders, a construction company out of Vineyard Haven, Massachusetts. The quartz countertop looks precisely like authentic concrete. Highly polished gray quartz countertops beautifully work with the yellow cabinetry in this small apartment kitchen by Russian design firm, Enjoy Home. 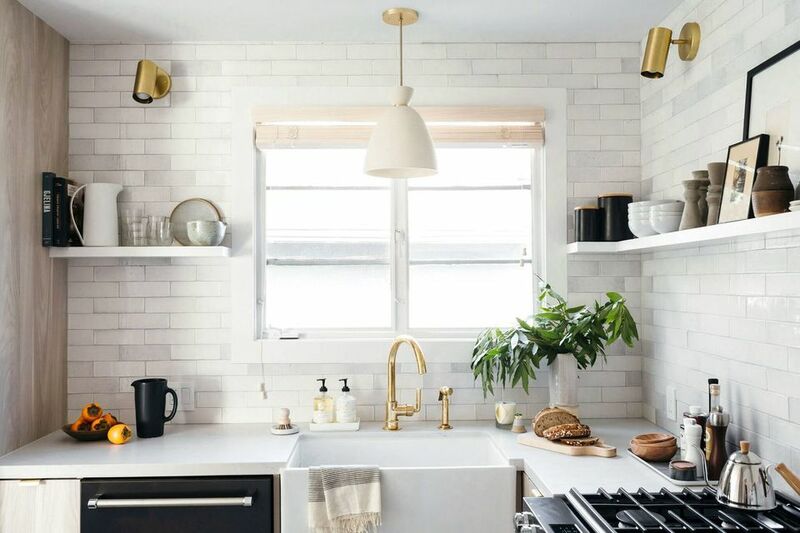 Finding the perfect countertop for your style and cooking needs can be incredibly challenging says, Jill Cordner, one of the interior designers for Homepolish, an online decorating service. She looked at a gazillion samples of quartz marble before going to a slab yard to view full-size options. The winning pick for this kitchen is a marble pattern called Helix by Caesarstone. Quartz countertops are becoming a staple in modern farmhouse kitchens. Case in point this lovely neutral cooking space by Jennifer Dennis. She is an award-winning interior design working out of the Washington, D.C. metro area. The shaker style cabinetry is a soft shade of gray. The color matches the new quartz countertops and subway tile backsplash. Large slabs of white engineered quartz and genuine Calacatta marble run throughout this chic cooking space by Natalie Chianese, one of the many interior designers represented by Homepolish. Red quartz countertops by Caesarstone personalize this white cooking space by Kitchen & Bath Design and Construction out of West Hartford, Connecticut. Two different styles of quartz dress up this cooking space by CM Natural Designs out of Marin County, California. The countertops lining the wall are gray quartz. On the kitchen island is a beige faux marble. A waterfall quartz kitchen island and matching dining table make this modern neutral kitchen by New York City based Turek Design incredibly inviting. The countertops lining the back wall are quartz with a soft gray finish. Both the island and table are a pattern called White Attica by Caesarstone.